The purpose of this paper is to report a new test method and make a recommendation to improve the procedures according to the findings. The test method involves measurement of high voltage substations earth grid impedance, by utilization of a variable frequency current source and frequency selective measurement techniques. Safety policies require that the values of earth impedances remain within the specified acceptable range and every utility is required to guarantee safe step-and-touch potential levels. It is therefore necessary to carry out periodic testing on substation earthing to monitor the condition of the substation earthing system. 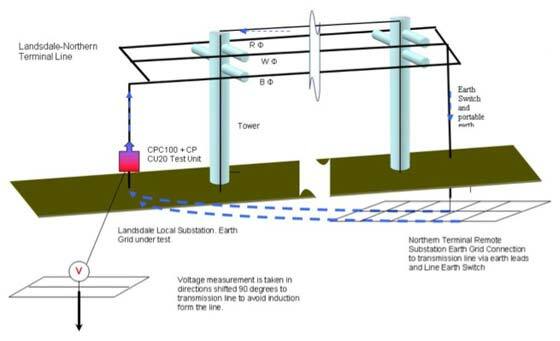 Knowledge of earth grid impedance of high voltage substations is also very important for correct operation of protection schemes and fault clearance. As the condition of grounding components change over time due to corrosion of earth cables, changes in the adjacent infrastructures and so on, it is necessary to measure the impedance of earthing grid periodically to ensure that the values are within expected range. Knowledge of the overall resistance ZE allows calculation of the total voltage rise of a substation under maximum fault current. Knowledge of the voltage gradient around the substation, especially close to the substation allows calculation of the step-andtouch voltages under worst-case conditions. According to international standards such as CENELEC HD637S1  or ANSI IEEE 80-2000 , 81-1983  it is recommended to use a current-voltage method otherwise known as fall-of-potential . Generally in a 90° angle (birds-eye view) two electrodes are placed outside the influence of the grounding system under test. One is used to inject the current (current electrode) and one to measure the voltage (voltage electrode). However because the area which is influenced by the grounding system is not so easy to determine, the current electrode is usually placed at a distance of at least 10 times, and up to 15 to 20 times the diameter of the grounding system under test. The voltage electrode then is placed in various distances. Close to the system under test, large voltage degradation is visible. The further the voltage probe is located from the system under test, the more stable the measured voltages become (FIGURE 2 & 6). For small grounding systems like a single tower, it is generally no problem to place the two needed electrodes and low currents generated by battery-operated equipment can generally do the job satisfactorily. However when measuring large substations, the distances are substantial and should be as large as 10 to 20 times the diameter of the substation. In some cases, measurements show peaks and drops until an area free of buildings and buried conductors or pipes is reached. Until then, erroneous results can be obtained. 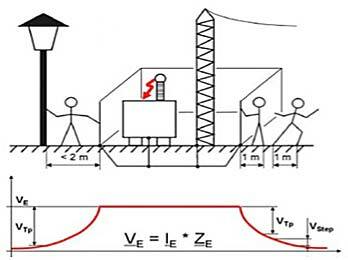 Voltage drops can be observed when measurement points are set close to objects, like towers of power lines leaving the substation, connected to the grounding system under test. Voltage rises can be observed when for example measurement points are placed over a buried pipe that runs close to the current electrode. Therefore it is often difficult to distinguish between drops, rises and stable results. To place the current electrode very far away is certainly a good idea, because then at least the influence of the current electrode can be minimized, however here the effort becomes even bigger. The biggest challenge is when the current electrode has to be relocated several times, before a stable measurement can be achieved. One method to overcome these measurement problems is to use diesel generators (weighing several tons) to generate currents that have frequencies slightly different from mains frequency and to feed in the currents over existing, de-energized power lines leaving the substation. The grounding system of the remote substation where the power line terminates is used as current electrode (see FIGURE 2 Impedance Measurement). The amount of current needed for such a test still has to be quite large to overcome mains frequency disturbances and the power requirement is enormous. But with these devices it is possible to measure ground impedances. However, the effort is by far too high to use it as a realistic approach for maintenance measurements. A new approach of Omicron is to combine the principle of simple battery operated equipment based on the variable frequency principle and use the existing power lines and the grounding system of the remote substation as current electrode. The test set CPC 100 and CP CU1 from OMICRON comprises of a frequency variable amplifier (29 kg), a coupling unit (28 kg) and a protection device (6 kg). The CPC 100 is a multi-functional, frequency-variable test set for testing various primary equipments. It is capable of generating currents up to 800 A or voltages up to 2000 V, with special software modules to be used for various automated tests on CTs, VTs, power transformers or other primary equipments. With other accessories it can also be used for tangent delta testing on power transformer bushings or windings, with test voltages up to 12 kV. In the application of ground impedance measurement it is used as frequency variable power generator, measurement tool and analyzer. 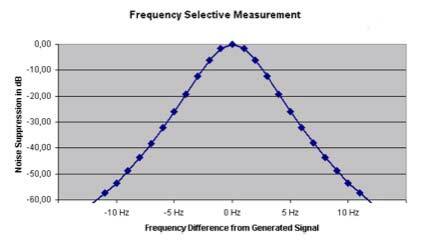 Due to the variable frequency generation, it is possible to generate signals first under and then above mains frequency. Using digital filter algorithms, the test set will measure only the signal with the frequency that is currently generated and filters out signals at other frequencies. Disturbances due to noise and electrical interference thus no longer influence the result. For safety reasons, the coupling unit CP CU1 is used for galvanic decoupling of the current output and the measurement inputs from the power line. This way, if fault or lightning occur during the test, the operator can be safe from dangerous voltages. For optimum performance there is a range selector switch for the current output, and a built-in voltmeter for a quick check of induced voltages or burden. Test currents of up to 100A can be generated for short cables, and for long lines of up to a few hundred kilometers, currents over 1A are still possible. The protection device CP GB1 is a tool for easy connection to the overhead line or power cable and existing grounding cables of the substation may be used. In case of unexpected high voltage on the power line due to faults on a parallel system, lightning discharges or transients due to switching operations, the GB1 is capable of discharging short transients or permanently shorting fault currents of up to 30 kA for at least 100 ms. These features will protect the operator in unexpected situations. The test itself is simple: the combination of CPC 100, CP CU1 and CP GB1 is connected to a de-energized power line (FIGURE 2&5); after removing the near end ground connection, test current with a different frequency than the mains frequency is injected. The voltage test probe then is located at various distances until stable voltage measurements can be observed. At this point the measurement is completed And the results can be stored in the CPC, downloaded to a PC and analyzed in a Microsoft Excel application. The test was carried out on 7th October 2004 by confirming outage on Western Power Corporation’s Landsdale Northern Terminal line. Northern Terminal Substation was the remote terminal and the earth grid at Landsdale Substation was measured. Earth Switches at both substations were closed and portable earths were applied to the lines in preparation for the test. CPC 100 and CP CU20 (a predecessor of the CP CU1) were connected to the line as per test set up and voltage measurements stake was inserted at different distances from the test point in a different direction from that of the transmission line in order to avoid induction. Measurements were carried out and test files were saved to the CPC 100 memory to be retrieved in the office. Test was performed at various frequencies (between 30-110 Hz) to suppress the noise and achieve a precise characteristic of the grid impedance under test. Impedances for 50Hz were extrapolated from the test results. The mass of the earth is not the only path for feeding the ground current. All metal structures such as pipes tubes, railway lines and Multiple Earthed Neutral (MEN) of distribution systems between the test point and the current auxiliary electrode form the path for the ground current, including the shield wire on the top of the pole. The impedance profile of the earthing system was obtained and the stabilization of the impedance at a distance above 100m was obvious. This data was then used to calculate the earthgrid potential rise during maximum earth fault conditions. Substation earthing system testing using the conventional method is arduous, time consuming and involves multiple heavy equipment producing end results that are sometimes unreliable due to electrical interference and noise. The conventional method requires high test currents in order to achieve a higher signal-to-noise ratio, therefore heavy equipment and generators are required to produce such currents. The alternative method using variable frequency technique, achieves the desired outcome with less cost, effort and resources and increases efficiency and accuracy. Gute arbiet, was Sie getan haben.